Digital SLR cameras have made it easier than ever before to photograph the night sky. Whether you're a beginner, nature photographer, or serious astronomer, this is the definitive handbook to capturing the heavens. Starting with simple projects for beginners such as cameras on tripods, it then moves onto more advanced projects including telescope photography and methods of astronomical research. With 80% revised and updated material, this new edition covers nightscapes, eclipses, using cameras with sky trackers and telescopes, and tools for identifying celestial objects and investigating them scientifically. Image processing is discussed in detail, with worked examples from three popular software packages - Nebulosity, Maxlm DL, and PixInsight. 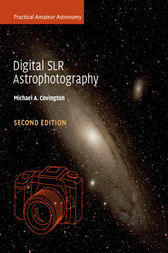 Rather than taking a recipe-book approach, Covington explains how your equipment works as well as offering advice on many practical considerations, such as choice of set-up and the testing of lenses, making this a comprehensive guide for anyone involved in astrophotography.